An all-day symposium April 22, 2009, at Georgetown University Law Center in Washington, brought together many of the attorneys whose work to create the Violence Against Women Act is narrated in Part 5 of Equal, including Vice President Joseph Biden (see my article in the New Republic of September 2008). I'm spoke on a mid-day panel, following two of the law professors and one of the judges whom I interviewed when reporting Equal. 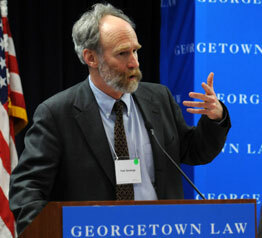 Fred Strebeigh, Author, "Equal: Women Reshape American Law"